The dessert café, Black Milk, has opened its first franchised store in Bolton, Greater Manchester, which features a botanical theme capturing the feel of its first café in the Northern Quarter of Manchester. The store offers customers a range of cakes, desserts, smoothies and its renowned Freak!Shakes, whether it’s for breakfast, lunch or just a snack. The new store has specially selected wall art and music playlist to create the right atmosphere and brand experience. Black Milk said that Bolton had several fundamental reasons for landing the first franchise after only two years of the original café opening. Firstly, it was proposed by a regular customer of the Manchester café who shared the same vision of quality and development. Secondly, Bolton was the hometown of two of the company’s senior team and the place of their education, adding a higher intrinsic purpose. Oliver Lloyd Taylor, Black Milk’s founder, describes the new store as a fusion of nu-wave interactive desserts and drinks that allow customers to fully submerge themselves into an exciting atmosphere and experience. Black Milk says its Freak!Shakes are famously irresistible with the Triple Oreo Cheesecake being the most popular. 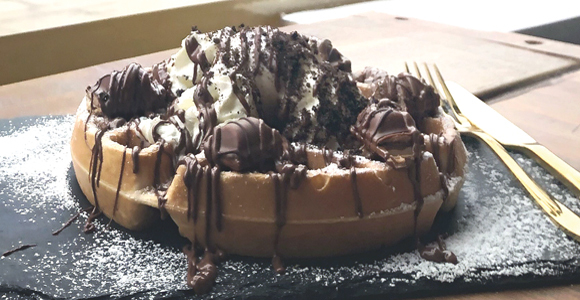 Its waffles include Salted Caramel, Sticky Toffee Banoffe and Kinder Mess. Customers can also choose waffle extras such as Chocolate Shot and Torched Marshmallows.